The key to many a kitchen is a smattering of the language of that kitchen. And I don’t just mean for health and safety reasons. For a start, the history and origin of the name of a dish is often a clue as to the origins of the dish itself. A knowledge of Persian certainly unlocked the door to my mother-in-law’s kitchen. Indeed, when I cheffed in Spain my cooking improved no end when I was able to ask for a skinned and boned chicken instead of a ‘chicken without shoes, hat or jacket’ (now would I make that up?). It has to be said that I was fortunate in selecting a Persian beau: Farsi is by all accounts an easy language, as it is Indo-European and fits comfortably into the European ear. It follows many of the same rules as Greek or Latin derived languages, and is also blissfully devoid of gender. 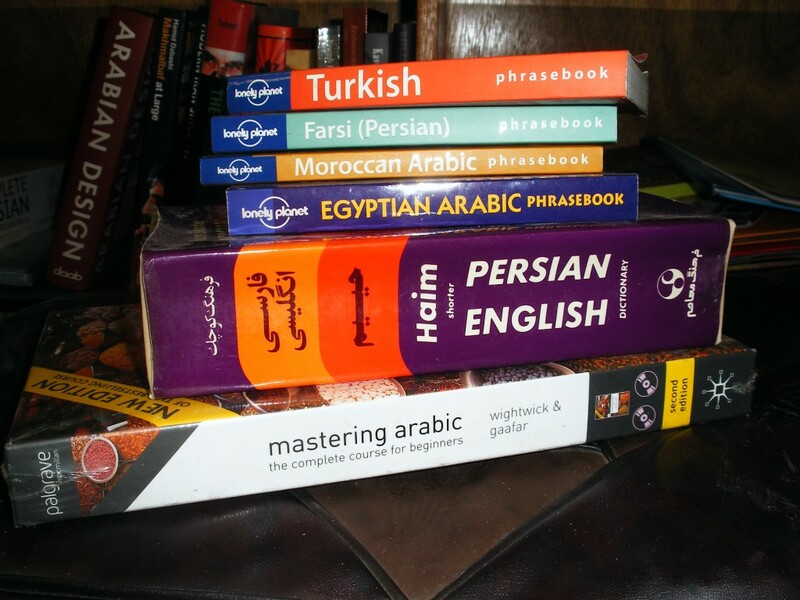 The business of learning it is heavily obfuscated by the fact that it uses the Arabic alphabet – so if you are going to give it a go, try and learn it phonetically first before the text books get at you; you will find it much easier. Farsi has Urdu, Hindi, Pashto and to a certain extent Kurdish as its cousins. And English, Russian, French and Spanish as its second cousins once removed. Turkic (or Altaic) languages (which spread from the Altaic mountains across to the Med) are also reputedly easy, although I have yet to cross that invisible linguistic line between not even recognising the language and understanding a few words. They seem to get incredible tongue-twisting mileage out of the letter ‘U’ and its vowel counterparts. Like Farsi, Turkish has neither gender nor definite article. Unlike Farsi, it has practically no irregular verbs, and it is pronounced phonetically. This should make it very easy to learn. I’ll just keep telling myself that, eh. The other main language of Veggiestan is Arabic, which is one of the Semitic/Afro-Asiatic family of languages (that’s for all you closet philologists out there). What can I say about Arabic? To the uninitiated it all sounds like a combination of the sounds ‘yuch’ and ‘la’. The alphabet is hard enough (although to anyone who has studied shorthand there is a certain logic to it). But you get a double whammy with Arabic as the language itself is fiendishly hard. Pronunciation is guttural (some would argue that as I come for Essex I should take to it like a seagull to candyfloss), and just for fun many of the pronounced letters are omitted from the written versions of words. Major respect to Westerners who manage to learn it. I have two tips for anyone wishing to speak Veggiestani. The first is to listen to as much trash TV and radio from your selected country as you can. It sinks in subliminally, believe me. And the other is to become a shopkeeper somewhere cosmopolitan. Like Peckham. Because whether you want it or not you will start to speak in tongues after a week behind the till. This entry was posted in Postcards from Veggiestan and tagged Arabic, Farsi, Indo-European, Middle Eastern Languages, Pashto, speaking in tongues, Turkic languages, Veggiestani. Bookmark the permalink.